A brother is the one who takes care of his sister in every possible way. To cherish such relationship Raksha Bandhan is celebrated to make the super cool brother feel special and to make them realize how much they mean to their sisters. 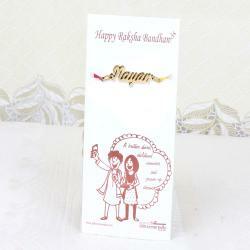 To express such love a special Raksha Bandhan gift can be gifted to them on the special eve. It has a personalized hand carved Rakhi dial made from metal which can have only 10 letters. This super cool Rakhi when tied on the wrist of your loved one will bring a special spark in the relation and will strengthen the bond forever. Product Consist: Personalized Brother Name Hand carved Rakhi Made out of Metal (Maximum 10 Letters only).